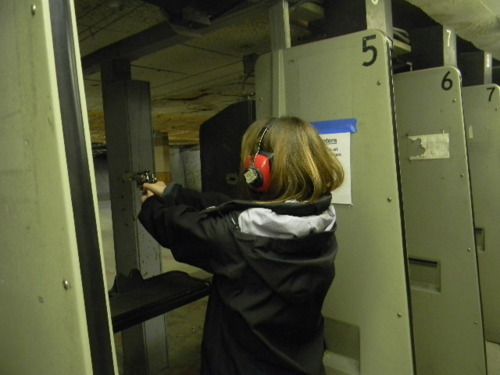 Gun handling in the U.S.
How can I go to America and not shoot a gun? 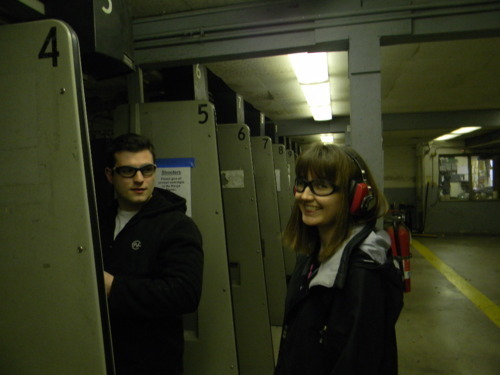 Of course I can’t, which is why we went to the shooting range today and I fired a gun for the first time. Yet another thing I can now cross off my imaginary list. I used two different types of guns, one .357 caliber shotgun and the other, a semi-automatic handgun used primarily for self defense. The laws of gun handling and ownership are quite strict in California in comparison to other parts of America, particularly in the Eastern and Southern parts of the U.S. I’m not too clear on the specific laws and regulations, but in general you have the right to own a gun if you intend to use it for self defense. There are also strict rules about locking your weapon and leaving it unloaded when not in use. However, the thing that surprised me the most about this whole experience was how easy it was to just walk into the shooting range, snag a couple of bullets and start shooting away like a maniac (at the target). There were no questions asked about my obvious (lack of) experience with gun handling. All I had to do was supply ID, sign my name, and briefly take note of the 7 or so house rules. After that, I was handed a gun and told to take aim and fire. Crazy stuff. I can’t tell you how nervous I was initially, my mother would be so proud. My advice would be if you happen to be in the United States of America, I recommend you start shooting something. I definitely see this experience as a significant example of cultural difference, because people’s reaction to guns here is quite relaxed. Many Australians are aware of the American way of thinking when it comes to guns in use for “self defense” and it’s almost comical to us at times. But I believe that U.S citizens take the right to bear arms very seriously. Didn’t stop me from having a laugh though. This entry was posted on January 1, 2011 by egorsky. It was filed under Cultural differences . Wow!! That looks amazing, I didn’t even think of doing that but now I think I want to when I go to the states this week! Yeah you’d really enjoy it I think! I forgot to mention that the people I live with, own guns so that is why I was able to go shooting, otherwise they don’t rent out guns or anything lol. But it wouldn’t be too hard to find someone with a gun here, the hard part would probably be to convince them to take you out with it. That is a totally unique cultural experience and you are right – it really underlines quite profoundly different attitude to guns and ideas about personal freedom and safety – possession, right to use, and all the rest of it. How did you react when you realised that the people you were living with owned guns – did it worry you? Are you living on campus? (I guess not??) I wonder what college rules are about gun possession, esp in light of the few recent gun-related incidents on campuses. When I was living in S Carolina a few years back, the campus police at the college I was at carried handguns and I found it really very confronting at first! Shooting game was also a big thing there too. I didnt participate but it did show up my own cultural position very strongly. Good on you for having a go – has it changed your own position permanently, do you think, or only when you have got that weapon in your hand? Kyran, let us know if you do try it out once you get to the States. I am living with a family now but I will be staying on campus at UCLA, guns are not allowed on campus at all, even if you have a permit. I am told that you can be arrested if found with one in your possession. I was actually very surprised when I discovered that they own guns and they were very keen to show them! It definitely made an impression on me. I always thought of guns as unnecessary and I’m against hunting animals for pleasure, but I was fine shooting at paper targets! I found that most of the people who go to the shooting ranges are excops, or military people, but even regular citizens who own guns participated. It’s not a huge deal for them, as it is in Australia.